I love this recipe because for me, it’s the ultimate comfort food. It makes the entire house smell amazing and I enjoy the complexity of the flavors. I cook this during football season because it’s the perfect dish to share with friends. In a Dutch oven combine the oil and flour to make roux over medium heat. Stirring constantly for about 25 minutes. It should be dark brown in color. Add the onion, celery and bell pepper and sauté until vegetables are soft. Add sausage, salt, pepper and bay leaves. Cook for a minute more. Add the prepared Knorr Liquid Concentrated Base. Stir until the roux and broth are combined and bring to a boil. Cook uncovered for 30 minutes, stirring occasionally. Add the chicken thighs and seasonings and simmer for about 2 hours, stirring occasionally. 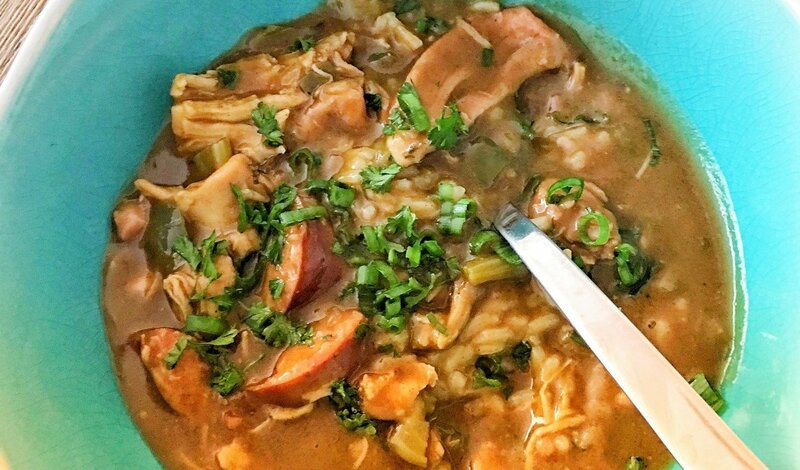 Remove the chicken from the gumbo, shred into pieces and return to the gumbo. Take a small amount of broth in a measuring cup and add the file powder to taste. Then add it back to the gumbo. Serve in warm bowls over rice.